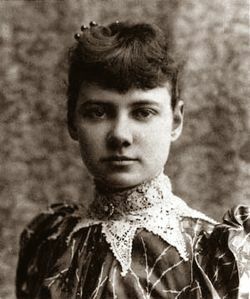 Nellie Bly (May 5 , 1864 – January 27, 1922) was an American journalist, author, and charity worker, who received initial renown after writing a stinging expose of the mistreatment of the mentally ill while faking insanity and living undercover at a New York mental institution. Today considered an innovator in the field of investigative reporting, she became a national folk hero after her 72 day record breaking trip around the world in 1889. Her idea for a newspaper story chronicling her round-the-world trip was presented to her editor at the New York World, but he thought a man would be more up to the task and worried about the amount of luggage she would carry. In answer to his objection, Bly came up with the design for a dress that would stand up to three months of wear and tear and the rigors of travel. Her initial goal for the trip was to beat the fictional record of Phileas Fogg, the protagonist from Jules Verne's, Around the World in 80 Days. Not only did she beat his record, she interviewed the renowned author after stopping in France on her journey home to the United States. Upon her arrival she was greeted with a parade and much fanfare (but no raise from her newspaper employer); still her trip was deemed, "a tribute to American pluck, American womanhood and American perseverance." Elizabeth Jane Cochran was born in Cochran's Mills, Pennsylvania, 40 miles northeast of Pittsburgh. Her father, Michael Cochran a wealthy former associate justice, known as "Judge" Cochran, died when she was six. (The town name was changed from Pitts' Mills to Cochran Mills in his honor.) Her father had ten children with his first wife. Elizabeth was the third of five children born to his second wife, Mary Jane Kennedy Cummings Cochran. Her father left no written will; consequently her mother lost the family property which was sold off and divided among the 15 children. Economic hardship was to follow the family throughout Elizabeth's, - nicknamed "Pink"' - childhood. Although her mother remarried, her stepfather was reportedly abusive and her mother divorced him. Perhaps as a result of an uncertain and difficult childhood "Pink" learned resourcefulness. She added an "e" to her last name and when she was no longer able to afford the tuition of the State Normal School at Indiana Pennsylvania she moved with her family to Pittsburgh where she worked at various jobs traditionally held by females. Soon, a column in the local Pittsburgh Dispatch titled, "What Girls are Good For," prompted her to write a fiery rebuttal to the editor. Impressed with her earnestness and spirit, he asked her to join the paper and christened her with the pen name, Nellie Bly, taken from the title of a popular song written by Stephen Foster. Bly focused her early work for the Dispatch on the plight of working women, writing a series of investigative articles on female factory workers. But editorial pressure pushed her to the women's pages to cover fashion, society, and gardening, the usual role for female journalists of the day. Dissatisfied with these duties, she took the initiative and traveled to Mexico to serve as a foreign correspondent. Then 21, she spent nearly half a year reporting on the lives and customs of the Mexican people; her dispatches were later published in book form as Six Months in Mexico. In one report, she protested the imprisonment of a local journalist for criticizing the Mexican government, then a dictatorship under Porfirio Díaz; as a result she was forced to return to the United States. Seeking a career that was broader in scope than theater and arts reporting, Bly left the Pittsburgh Dispatch in 1887 for New York City. There she talked her way into the offices of Joseph Pulitzer's New York World. It was here that she came up with the idea to go on an undercover assignment in which she would feign insanity in order to investigate reports of brutality and neglect at the Women's Lunatic Asylum on Blackwell's Island. The assignment resulted in her being dubbed "daring girl reporter"' by other reporters. After a night of practicing deranged expressions in front of a mirror, she checked into a working-class boardinghouse. She refused to go to bed, telling the boarders that she was afraid of them and that they looked crazy. They soon decided that "she" was crazy, and the next morning summoned the police. Taken to a courtroom, she pretended to have amnesia. The judge concluded she had been drugged. She was then examined by several doctors, who all declared her to be insane. Positively demented, said one, I consider it a hopeless case. She needs to be put where someone will take care of her. The head of the insane pavilion at Bellevue Hospital pronounced her "undoubtedly insane." The case of the "pretty, crazy girl" attracted media attention: Who Is This Insane Girl? asked the New York Sun. The New York Times wrote of the "mysterious waif" with the "wild, hunted look in her eyes," and her desperate cry: "I can't remember. I can't remember." After ten days, Bly was released from the asylum at The World's behest. Her report, later published in book form as Ten Days in a Mad-House, caused a sensation and thrust her into the national limelight. While embarrassed physicians and staff fumbled to explain how so many professionals had been fooled, a grand jury launched its own investigation into conditions at the asylum, inviting Bly to assist. The jury's report recommended the changes she had proposed, and its call for increased funds for care of the insane prompted an $850,000 increase in the budget of the Department of Public Charities and Corrections. Her most publicized reporting stunt was her trip-around-the world. On November 14, 1889 she embarked from New York City on her 24,899-mile journey. Journeying by both ship and train, she traveled through England, France, the Suez Canal, Ceylon, Hong Kong, and Japan. "Seventy-two days, six hours, eleven minutes and fourteen seconds after her Hoboken departure" (January 25, 1890) Nellie arrived in New York. The publication of her book, Nelly Bly's Book: Around the World in Seventy-Two Days marked the height of her journalistic career. She followed this success with reports on other issues of the day including a piece about the Oneida Community, a utopian religious group, and interviews with Belva Lockwood, (the Woman Suffrage Party's candidate for president in 1884 and 1888) and Eugene Debbs the Socialist leader of the railroad union. The World also featured a front-page interview she conducted with the anarchist Emma Goldman. Having eclipsed what was expected of women in her time, at the age of 30, Bly was ready to settle down. Nellie Bly married millionaire manufacturer Robert Seaman in 1894, who at age 72, was 44 years her senior. He was President of the American Steel Barrel Company and the Ironclad Manufacturing Company. She retired from journalism, and became the president of the Iron Clad Manufacturing Co., which made steel containers for milk cans and boilers. In 1904 she invented and patented the steel barrel that was the model for the 55-gallon drum still in widespread use in the United States. Her husband died that same year, and although she was one of the leading women industrialists in the United States for a time, mismanagement forced her into bankruptcy. After a long hiatus from reporting, she went to work at the New York Evening Journal in 1912. A series of legal problems arising out of her business interests caused her to flee to Europe where she found herself in the midst of World War I. Never one to shy away from a challenge, Bly began to send reports back from the Eastern Front to her New York paper. She was the first woman and one of the first foreigners to visit the war zone between Serbia and Austria-Hungary. Mistaken for a British spy, she was arrested briefly. After the war her career wound down and Bly continued with her interest in social activism. She wrote in support of birth control and against capital punishment. Her stories about broken families led to her advice column for the The Journal. She answered all letters addressed to her and undertook a personal, if not professional, crusade of placing abandoned children in homes. Nellie Bly died of pneumonia at St. Mark's Hospital in New York City in 1922, at age 57. In an era of Yellow journalism and at a time when women were just beginning to break into the field of journalism the type of undercover investigative reporting undertaken by Bly, set an important precedent. As forerunner to Ida M. Tarbell, and Dorothy Thompson, she successfully pioneered working in the male dominated field of newspaper writing. And like author Charlotte Perkins Gilman and lawyer Belva Lockwood she addressed social issues that desperately needed attention at the turn of the 20th century; issues that affected not only women but all minorities marginalized by society. For Bly this was especially true in the case of children unprotected by labor laws. In her own childhood, she witnessed first-hand how property laws - which did not protect the rights of widows in those days - marginalized women. Additionally, in an unregulated economy, Bly was at a distinct disadvantage in running her husband's business after his death. In her time, Bly reported the news from the perspective of a woman and, as such, helped to elevate the role of women in American society. Bly was the subject of a 1946 Broadway musical by Johnny Burke and Jimmy Van Heusen. The Nellie Bly Amusement Park in Brooklyn, New York City, was named after her, taking as its theme Around the World in Eighty Days. Nellie Bly is a character in the computer video game Worlds of Ultima: Martian Dreams. Nellie Bly was one of four journalists honored with a U.S postage stamp in a Women in Journalism set in 2002. From early in the twentieth century until 1961, the Pennsylvania Railroad operated a parlor-car express only train between New York City and Atlantic City that bore the name, Nellie Bly. Nellie Bly's investigation of the Blackwell's Island insane asylum is dramatized in the 4-D experience shown in the Annenberg Theater at the Newseum in Washington, D.C..
↑ Brooke Kroeger. Nellie Bly: daredevil, reporter, feminist. (New York: Times Books. 1994), 529, reports that although a birth year of 1867 was deduced from the age Bly claimed to be at the height of her popularity, her baptismal record confirms 1864. ↑ 3.0 3.1 Nellie Bly. Ten days in a mad-house; or, Nellie Bly's experience on Blackwell's Island. Feigning insanity in order to reveal asylum horrors. (New York: N.L. Munro, 1887). ↑ "The remarkable Nellie Bly, inventor of the metal oil drum," Petroleum Age, 12/2006, 5. ↑ "Seaman, Elizabeth Cochrane" Women in World History. ↑ "After the poorly received Nellie Bly (1946) … [stage director Edgar J.] MacGregor retired." musicals101.com. ↑ USPS Press Release (September 14, 2002), Four Accomplished Journalists Honored on U.S. Postage Stamps, usps.com. ↑ Newseum Newseum.org. Retrieved June 11, 2008. "Elizabeth Cochrane Seaman," Dictionary of American Biography. American Council of Learned Socieities, 1928-1936. Reproduced in Biography Resource Center. Farmington Hills, MI: Gale, 2008. "Nellie Bly," Contemporary Authors online, 2008. Reproduced in Biography Resource Center. Farmington Hills, MI: Gale Group. Ten Days in a Mad-House, and other early investigative reports by Nellie Bly Digital.library.upenn.edu. Ten Days in a Madhouse Librivox.org. 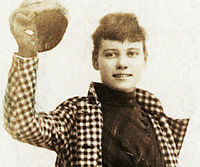 New York Times: Nellie Bly, Journalist, Dies of Pneumonia Nytimes.com. Nellie Bly's Book: Around the World in Seventy-Two Days Digital.library.upenn.edu. This page was last modified on 14 November 2018, at 16:34.